I have a coupon, how do I use it? Coupon and vouchers are entered in the last step of the checkout process. Once you have finished adding to cart your prescription/none prescription orders, select Checkout and enter your coupon code in the Payment Method step. What does best price guaranteed means? At the rare case you compiled your order (frame + lens+ tint+ coating) and found the same product package + shipping being offered at a lower price, not only we will match that price but also offer an additional discount to beat it! If this is the case please don’t worry, submit your order and contact us by email, phone or use our contact us page. Make sure to provide your name, order number and a link that points to the location you found the product cheaper. Our dedicated optician’s customer service will research the site and beat the price in the form of a credit back to your preferred payment method. Site must be a verified online store with a pass score at scamadviser.com. My prescription does not have coatings specifications, should I order it anyway? My prescription does not have anything to do with materials or coatings, should I follow it to the letter and select exactly what is listed? The only data you must enter EXACTLY as it written is your prescription powers: SPH, CYL, ADD, AXIS Prism and PD. Some are highly common such as SPH, CYL, AXIS and PD that most provided prescriptions has and some are less common such as Prism. This is the data that is required for you to be able to see well. At overnight Glasses we also carry a wide range of Tints (lens colors) and coatings. Unless specifically stated otherwise by your physician, these can be added to any prescription and solely based on where and what you will do with your glasses. Here are several examples of great combinations of tints and coatings that are best suited for a certain activity: Driving. If you find yourself spending long hours on the road or simply wish to have sharper vision while driving, the following combination will be best for you: Trivex HD performance lenses + Premium Anti-Glare will give the absolutely best night driving vision you will get with any glasses. Sport activities. Either you a fisherman who want to see beyond the water glare, a skier, golfer, professional driver or biker or simply wish to be able to get a pair of glasses that will give you an edge; you will want to have them polarized. Polarized glasses remove the glare created from surface reflections during the day, designate better between colors and help you make swift decisions when you need to make them. The following combination is recommended Polarized tint+ Trivex HD performance (https://www.youtube.com/watch?v=knnSKVROtzA ) + Premium Anti-Glare+ Easy Clean. We will know to apply the Anti-Glare only on the back of the lens to remove the reflections from your eyes and give you the sharpest vision possible. I cannot find my PD, what should I do? 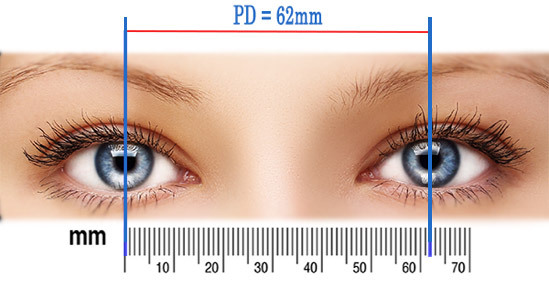 If you don’t have in your possession glasses with clear lenses, you may measure your PD using this method. 1) Place a mm ruler horizontally on your nose bridge, zero slightly below your right eye; 2) Ask a friend or use your mirror to see the distance on the roller. The distance measured is your PD. Although we don’t recommend this option. If you are unable to use the methods above you may use the general PD for: Women 62 and Men 64. How long should I wait between prescription checkups? The industry standard says you should not wait more than a year between checkups. I don’t have my prescription in my possession, where should I acquire it? If you are not in the possession of your prescription you should contact the doctor who prescribed it for you. Legally doctors are required to prescribe you with a full prescription that is best suitable for your needs, and make it available for you at all times. The prescription includes but limited to: SPH power, CYL power, Axis, PD, and Addition. Is buying eyewear on the internet recommended? Don’t hesitate to purchase your glasses from our site! We have put in place many tools that will make your shopping experience an easy and convenient one, with many of the same benefits as a retail store but none of the drawbacks. Our interactive V-Try feature allows you to see what the glasses will look like on you before buying. Simply by uploading a photo of yourself or by using your webcam, you can virtually “try on” over 2,000 pairs of glasses, and ensure a perfect fit. 60-70% of our orders are from repeat customers, if that is any indication. How are your prices so low? Do low prices mean low quality? By manufacturing the glasses ourselves, we are able to keep our prices low without sacrificing quality-even better; we have strict quality control over all our products. This eliminates unnecessary costs and keeps overhead low, the benefits of which are passed on to you, the consumer. Frames and lenses are systematically evaluated and only those of superb quality are offered on our site. What is included in free prescription? Unless stated otherwise in one of our promotions, free prescription includes: Single Vision (reading / distance) 1.50 lenses, with prescription SPH up to -3.25/+3.25 CYL up to -2.00/+2.00 and no additional lens add-ons such as Tint, Anti-Glare, Transitions, easy clean or other available lens add-ons. How can I place an order for eyeglasses at overnightglasses.com? Placing an order is a simple four-step process. Select a frame. After making your selection, select insert prescription; enter your prescription in the designated fields. When entering your prescription, please do not change the signs that are associated with sphere and cylinder numbers. This is the most common mistake people make when ordering prescription eyewear online. Then you will have a chance to review your order and it will be added to the cart. Don’t hesitate to contact us if any issues. How secure are my credit card details and information? We process all transactions through PayPal and Amazon Payments. Our servers are completely secure and we do not retain any of your private information. How long will it take to receive my eyeglasses? Most prescriptions will take us no longer than 4-5 days to complete and ship out from our laboratory, after it depends on the shipping method you selected during the checkout process. In general you should receive your order in less than a week. I received a damaged pair of eyeglasses or the prescription is not what I ordered. Although extremely rare due to our strict quality control, sometimes mistakes do happen. If we send you a faulty product or the wrong order, you are entitled to a full refund. Please refer to our refund policy. I left a message at customer support center and did not receive a reply. Messages received on our system are replied to within 24 hours. To ensure that you receive our reply, add our email address to your address book or trusted senders list.